This hexapod robot kit is a creative robot platform invented in Canada. Assembled with ez-bits, Six is a very customizable robot with 6 legs and 12 degrees of freedom. The joints are powered by 12 heavy duty servo motors, allowing unique, dynamic movement. The removable ez-bit joints and top mounted camera enhance Six's ability to interact with the world. Unleash your creativity! 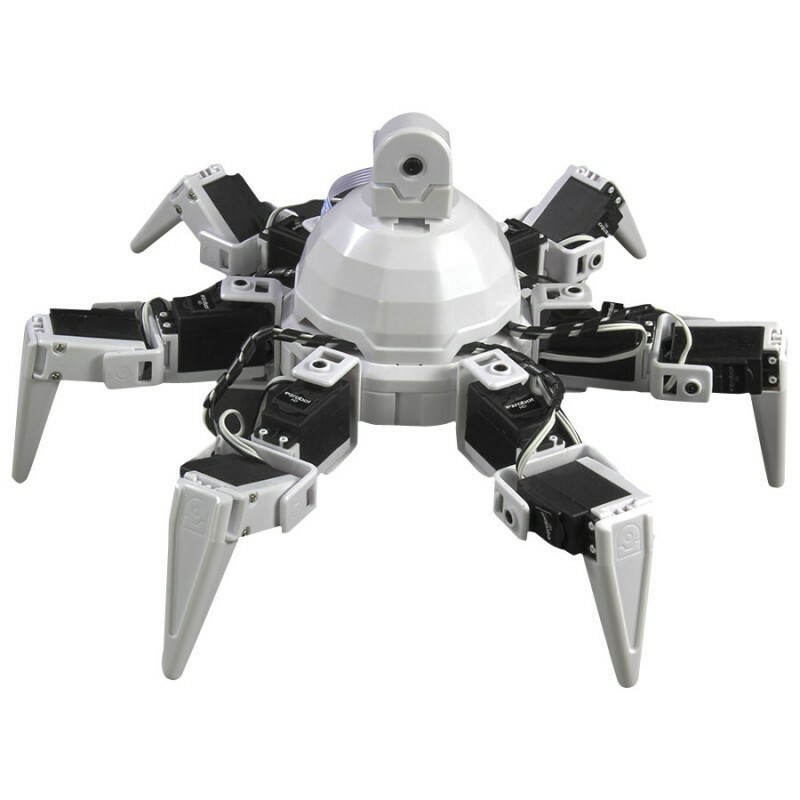 Discover how versatile a hexapod robot can be. Easily program new movements and interactions with the included ez-builder software. Like all Revolution robots, Six is a great platform to customize with additional ez-bits using Clip'n'Play technology. There are 12 female ez-clips surrounding the circular body, and 1 female ez-clip on top of the dome. Simplicity inspires creativity! ustomize your robot with ez-bits. All ezrobot Revolution parts include ez-bit connections. Simply slide the tab into the slot to establish a secure bond. The parts may be separated by sliding them apart. Multiple ez-bits can be connected together to make arms, legs, or anything else you dream up! If hardware is the heart of your ezrobot, then software is the soul. Introducing ez-builder, the world's easiest, most powerful, and most scalable robotics software. ez-builder takes a productive and unique approach to programming your robot. Simply add behaviors such as camera tracking, speech recognition, Wii controllers, GPS, GAIT positioning, and hundreds more! Like a flip book, the Auto Position in ez-builder is used to animate your ezrobot. It's like magic! Simply move your robot into positions to create an animation routine. Playback animations based on triggers, such as when the robot sees your face or responds to a voice command. It is now easier than ever to teach your robot how to move, dance, climb stairs and more!